The ad: "The Titanium Turbo is the high performance electric razor that will give you a close, comfortable shave - the smoothest shave - at a fraction of the cost of other razors. 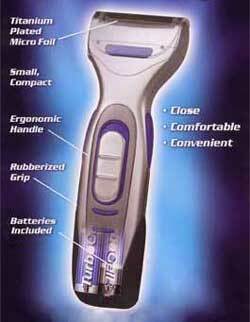 It's small and easy to handle yet is powerful enough to us as your primary shaver! 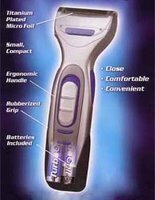 The secret is the razor like design with 24 micro blades in the titanium plated head." Sounds great right? But what does titanium have to do with shaving? And what is titanium? The only real contribution titanium will make to a razor is that it makes the blades non-corrosive, which means it won't weaken the blades. Not weaken, perhaps. But that's not the same as not dull the blades. Razor blades wear down, that's a fact. Exactly how fast depends on a few other factors. No razor will last you forever. Shaving your face with the same titanium razor 5 years from now will yield the same results as if you were shaving with your titanium watch or your titanium golf club. The ad: "Want younger-looking skin in just 14 days? Try this exclusive patented makeup formula with BotafirmTM- a patented blend of hexapeptides and botanicals- to reduce lines up to 50% in just 2 weeks. Specially formulated for dry skin, this moisture-rich formula helps restore skin softness and smoothness with medium coverage to blend away imperfections." You do know there is no such thing as botafirm, right? 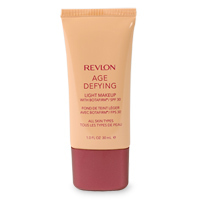 It's just a word created by Revlon to make their product sound more contemporary. And not coincidentally, botafirm sounds alot like botox - the botulism toxin that people have injected into their faces to reduce wrinkles. There is no scientific proof that a product called botafirm even exists. Really. We all want the best, usually without having to pay the accompanying price, and we want it all yesterday so that it takes effect last week. And even if tissues are laced with copper, or milk contains glue to make it whiter, or toothpaste starts containing stuff called "bleachtex" - we will buy these products. Why? Because it just sounds too good to be true. Are you trying to tell us, in your own way, that you want a shaver and makeup for christmas? You are so right! Titanium is such a joke. You have excellent insights on the world. Keep exposing more of this advertising nonsense and enlightening people. You are a hero for saying the things that no one else says!